The aim of reclaiming Green and Blue Networks is now integrated into new projects (corridor conservation) and is being implemented into the old motorway network (restoration of interrupted networks). The unique nature of this work lies in the feedback provided from a very recent motorway (A89) as well as the improvement of ecological transparency in the largest French motorway network, in the context of an adapted procedure: the Green Motorway Package (le Paquet Vert Autoroutier - PVA), which includes a “biodiversity” component aimed at repairing the ecological disturbances caused by motorways in service. 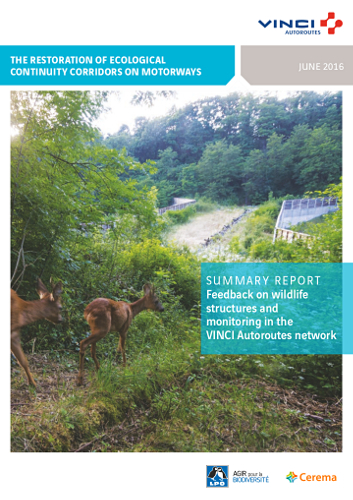 This work, the result of six years of design, implementation and assessment provides valuable recommendations on new projects and adaptations of existing structures. It draws together and compares very different experiences, suggests improvements, offers practical recommendations, guidelines for use, techniques, and assessment protocols.